Qlik, originally founded in 1993 in Lund, Sweden, moved its headquarters to the United States in 2005 after raising funds from several venture capital firms. QlikView, the company’s virtually unknown product at the time, was very aggressively marketed after the VC investment. This created enormous attention and traction, and in 2010 Qlik went public on NASDAQ. Qlik was acquired by the private equity company Thoma Bravo and was delisted from the stock exchange in 2016. Until the general availability of Qlik Sense in 2014, Qlik was a one-product company. 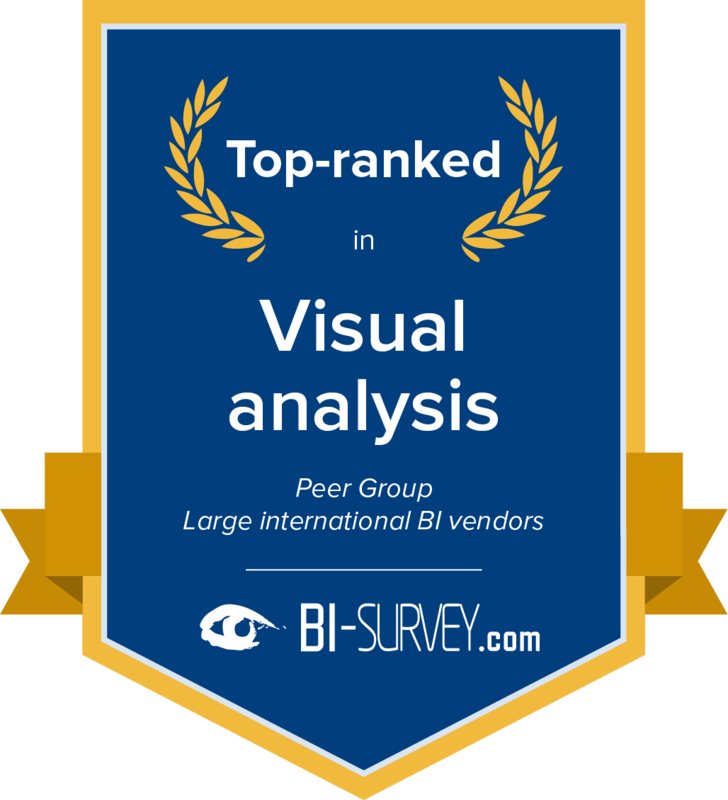 Today, the vendor provides a portfolio of visual analytics offerings. With these, Qlik focuses on integrating different data sources and empowering data governance, supporting people with its platform and supporting analysis using its associative model. This product review describes Qlik Sense. The vendor pursues a platform approach which aims to empower data usage by obtaining the governance, providing a platform for people’s visual analytics needs, and helping find innovative ideas by navigating data using an ‘associative’ model. Qlik’s products use a common data engine called QIX (Qlik Indexing Engine). Qlik’s platform consists of several components including Qlik Sense Enterprise and Qlik Sense Cloud, as well as the Qlik Analytics Platform for developers, QlikView and Qlik NPrinting, acquired in 2015 for enhanced printing and page-based layout. The Qlik DataMarket was introduced as a marketplace providing external data for analyses such as weather and currency information. In 2017, Qlik acquired its Swedish partner Idevio to provide advanced features for spatial analysis. This solution is being sold as Qlik GeoAnalytics. The Qlik Sense product is positioned as a self-service data visualization solution providing immediate analysis results and the capabilities for business users to independently build appealing, interactive dashboards and quickly deploy analytical apps without extensive upfront efforts. Qlik Sense has also been supplied with enterprise features such as a central library for common metadata and a single portal for accessing and reusing data assets and apps generated. Qlik NPrinting is a report generation, distribution and scheduling application which can be used to create reports based on Qlik Sense or QlikView content. It enables organizations to create reports in a variety of popular formats including Office and pixel-perfect PDF files. QlikView was the vendor’s first analytics product and the tool it became famous with. It is a dashboard and analysis product based on in-memory technology to deliver exceptional performance for highly responsive analyses and interactive dashboards. 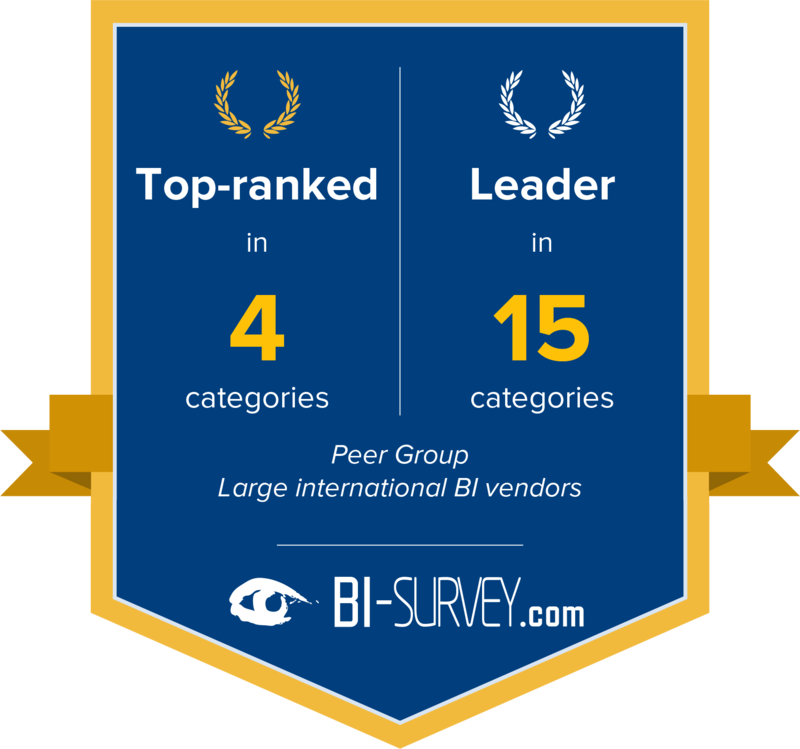 It was the first tool marketed under the “data discovery” and “modern BI” terms to differentiate it from traditional BI suites. This effectively created a new market into which many other vendors have since followed. The solution was positioned as a self-service platform targeted at business users, enabling them to analyze data without having to consult developers for new reports, dashboards or analyses on new data. Based on the in-memory and ease-of-use heritage of QlikView, Qlik Sense is positioned as the strategic offering for new customers for most use cases. Some of Qlik’s success is due to its non-technical marketing and sales strategy (“land & expand”). Its visual analytics products are clearly designed to appeal primarily to business users, who can achieve results without waiting for assistance from IT. Qlik consistently emphasizes ease of use, rapid deployment and high performance over more complex technical, architectural and administrative strengths that are the strongholds of traditional BI suites. 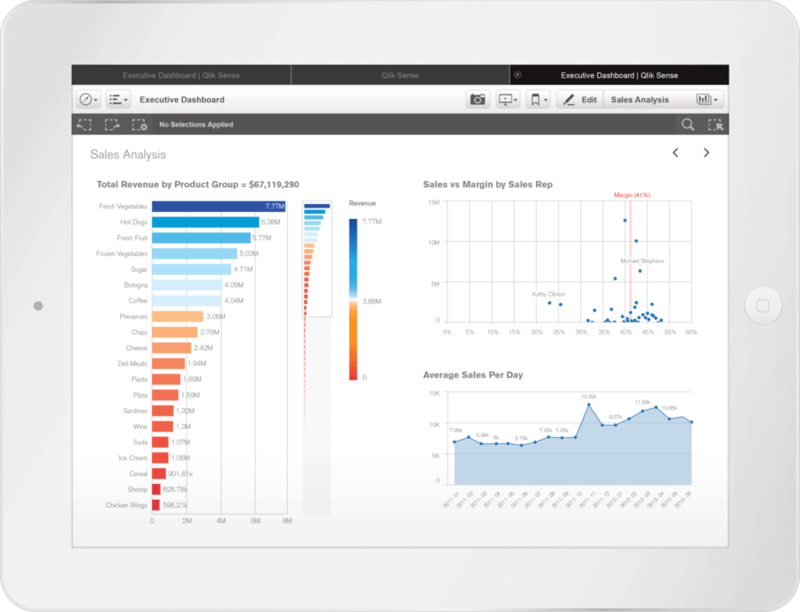 In the hope that the product’s simple and user-friendly features will convince business users to upgrade and help spread the product around the company, Qlik offers some versions of its tools free of charge (Qlik Sense Desktop without restrictions, QlikView with some restrictions and Qlik Sense Cloud, which is free for up to 5 users). 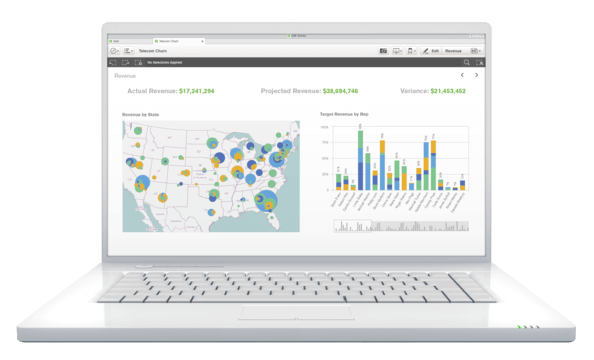 Qlik addresses accounts of all sizes: from desktop-based single user scenarios to enterprise standard deployments in large accounts. The vendor has an extensive partner channel and it addresses mid-market accounts largely through these partners. Qlik has a web-based program for direct sales to small companies, and shares the large enterprise market with the large generalized consultancy companies. Qlik Sense is a platform built on the associative, columnar, in-memory engine QIX. End users access the complete breadth of analytics functionality (including data discovery, visualization, dashboard and app creation, data preparation and collaboration on data storytelling) through a unified web or desktop client. Applications built are hosted on the Qlik Sense hub and can be organized by streams based on workgroup or function to apply security. Two administration front ends are used to manage the server: Management Console and Deployment Console. The Qlik Management Console (QMC) is designed to control and manage all server components such as the QIX engine, the scheduler for data loads, the repository for user and rights management and a repository for storing the application (QVF) files, as well as monitoring the environment. Qlik Sense can be deployed in a distributed and scalable architecture where several servers are used as nodes, each performing different tasks, or even in multi-cloud environments. Data extraction, transformation and loading (ETL) processes are performed using a wizard (Visual Data Preparation) for data preparation tasks. Qlik offers algorithms based on machine learning to detect join candidates not only based on the content of all fields in all tables. With its June 2017 release, Qlik reduced the necessity to write Qlik Script to prepare data for analytics. Most functions can now be used in a business user-friendly and visual environment, leaving only more complicated functions to be implemented via the script editor. Visual data preparation offers decent data profiling, creating a script that can be enhanced by experts. Existing preparation scripts can be used in the visual environment. The script editor is available for more complex transformation tasks, which usually need to be carried out by developers or trained power users. The product adds most value when it comes to cluttered and diverse data, because Qlik Sense offers data profiling and comprehensive suggestions for join candidates, effectively reducing manual effort and increasing quality by circumventing typical pitfalls when joining data sets. Data is stored in a set of tables, which are compressed and loaded into memory. The data, the data model and visualizations are stored in QVF files in Qlik Sense. In addition, the product supports QVD and QVW files, the same formats as used by QlikView to leverage and reuse these models. In the case of QlikView application files (QVWs), only the data and data models are reusable, not the visualizations created in QlikView. For data that should reside at the source, Qlik Sense offers a hybrid approach using a capability called Direct Discovery. Direct Discovery allows some data elements to not be loaded into the Qlik Sense data model, but still be available for query purposes. Qlik Sense can create centralized libraries of reusable definitions, analytics and visualizations. However, these libraries are currently part of a QVF file and therefore only available in a single Qlik Sense application, or they must be reused in other applications. Recent improvements include Qlik’s “on demand app generation”, which enables users to access and perform associative analysis on big data sources. Qlik has also started to give customers more freedom when choosing deployment options. Cloud and on-premises applications can be mixed based on the distinct requirements in each use case. Qlik aims to advance the use of machine learning and AI for user guidance to further support the user during all stages of analytics in pursuing its vision of “augmented analytics”. 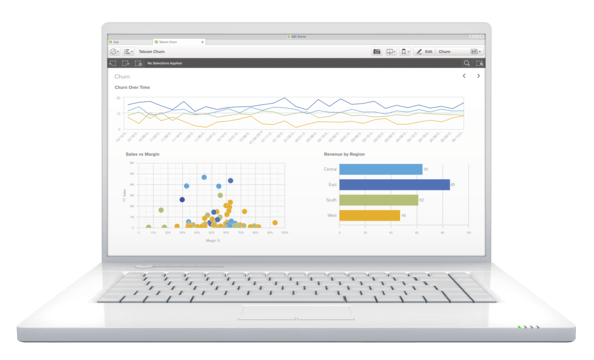 Qlik Sense offers a web client for enterprise use and a functionally equivalent desktop client for personal use. Both clients offer data preparation, creation of visualizations and applications, data discovery, analysis, collaboration and data storytelling. While data preparation in complicated cases requires scripting, Qlik Sense increasingly offers visual data preparation for business users with data profiling features to load data sets. Analytical applications can be created by business users via a modern drag-and-drop interface. The main data display objects are interactive visualizations including a comprehensive selection of charts, multi-layer maps and tables (including pivot tables). Since the April 2018 release (improved in June 2018), Qlik has offered chart suggestions to make it easier to create visualizations by allowing users to drag and drop fields onto the canvas. The solution automatically links all objects and sheets, so dashboards can provide a highly aggregated view of the data with the ability to jump to detailed analysis within the same application. External content can be included in dashboards via widgets. The Bookmark function stores a data context and can contain user comments, thus adding to the collaboration and storytelling capabilities of Qlik Sense. The associative functionality provided by the QIX engine offers interactive exploration for users consuming applications and freely analyzing data sets. Users can make selections in any chart or object and all charts in the app will update immediately to reflect the new context. 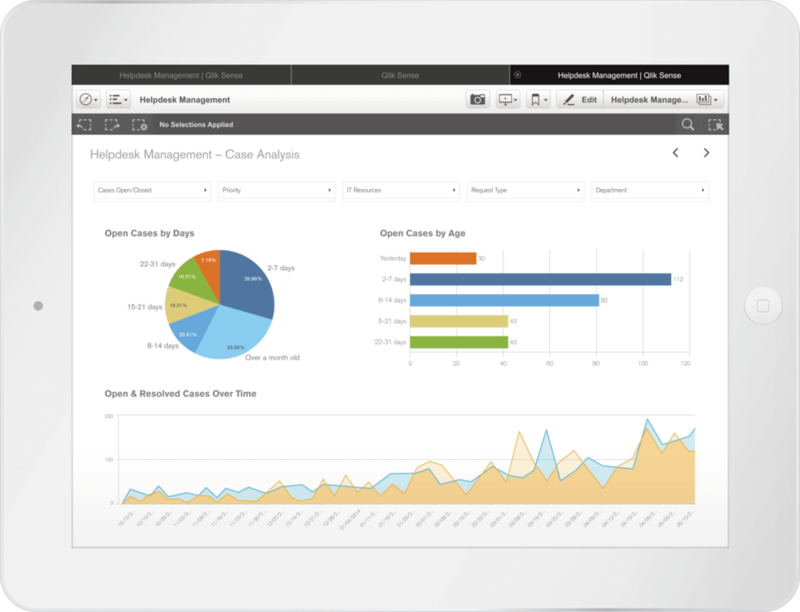 Qlik Sense highlights the user’s current selection and shows associated data in white as well as unrelated data in gray. It also provides a strong search feature that exposes field values, associations and thumbnails of objects that meet the criteria. In general, the whole tool is well optimized for an interactive user experience. 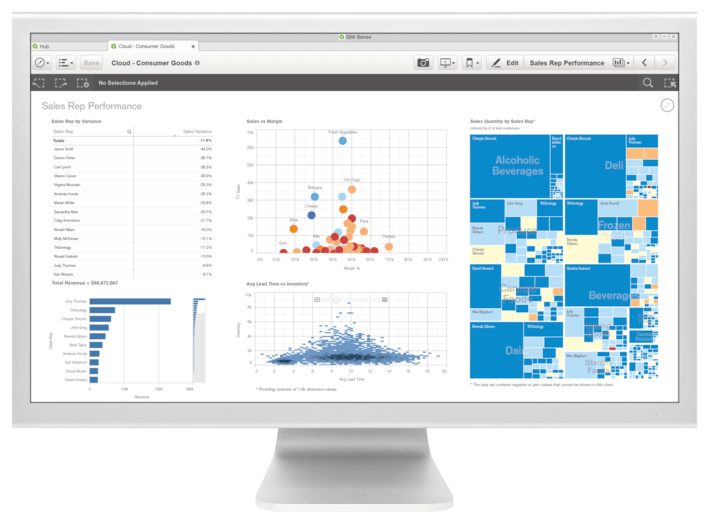 Besides its capabilities for creating visual analyses and applications, Qlik Sense provides dedicated features for data storytelling. Data stories resemble presentation slides and can either be consumed independently or interactively presented and analyzed. They are created using multiple visualization objects or whole application pages. Visualizations and tables are pinned to a story with the option to preserve not only the applied filters, but also the complete state of the objects in a snapshot even if the underlying data changes. Objects can be enhanced by highlighting relevant values and adding comments when compiling data stories. 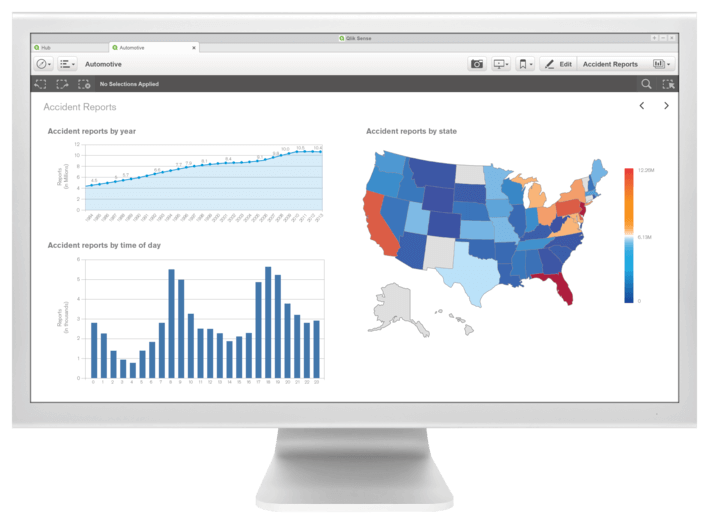 Qlik Sense offers an integrated approach to data storytelling, allowing users to jump directly into the live analytics application for further detail analysis. In addition, the developer can add comments, text or other graphical objects to the slides. Stories can be exported to PowerPoint or PDF if needed. The solution is strongly oriented towards interactive data analysis and visualization. Nevertheless, reports and printing can be compiled centrally or by users. Qlik NPrinting allows organizations to create and distribute Microsoft Office, pixel-perfect and web reports based on visualizations from Qlik Sense for standard reporting and report books. Reports can be distributed through email or to the Qlik Sense hub, with data specific to each recipient. Qlik Sense is mostly used for dashboard creation, standard reporting, ad hoc queries and basic analysis, which has fallen from 2nd to 4th place in the ranking of use cases since last year. Viewing content is now the number 1 task in Qlik Sense, showing how deployments mature over time. The product is used by a median of 50 users. Qlik Sense is mostly being deployed by larger companies, serving a slightly above average share of users. Performance is the clear highlight for Qlik Sense customers this year. The product seems to be well-known for its good performance and appears to keep its promises in this regard. 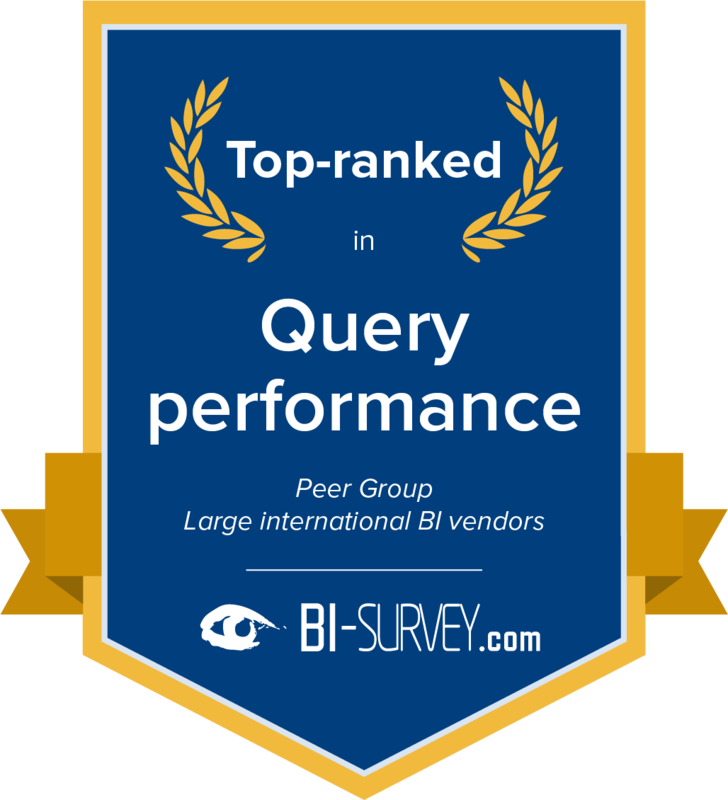 Thanks to its mature, sophisticated in-memory engine, Qlik Sense achieves top and leading ranks in the ‘Query performance’ KPI and the aggregated ‘Performance satisfaction’ KPI. Qlik Sense is clearly a business user friendly solution which is equipped with ever more user guidance functions from release to release. 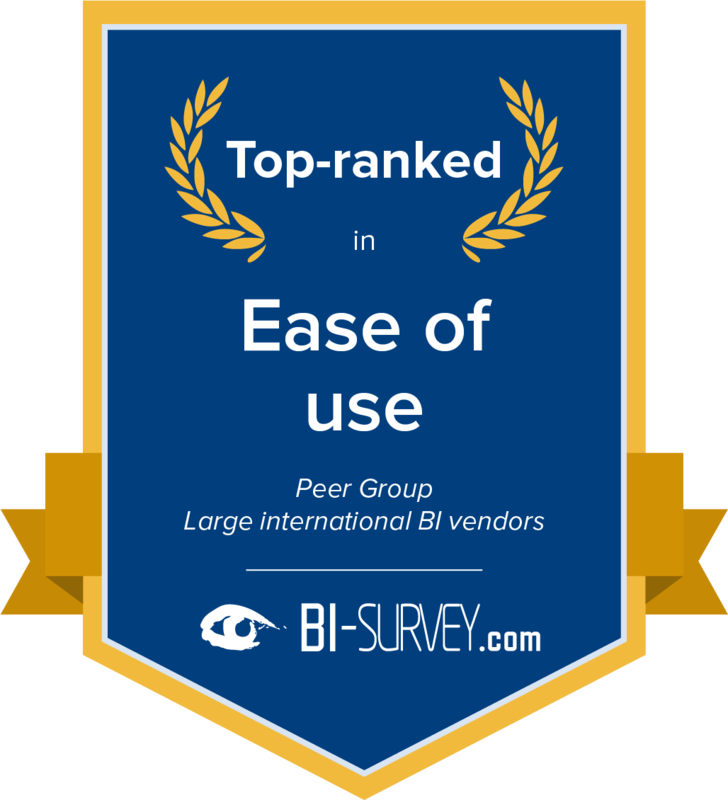 A higher frequency of customers say they use it for self-service tasks than users of products from other large international BI vendors. 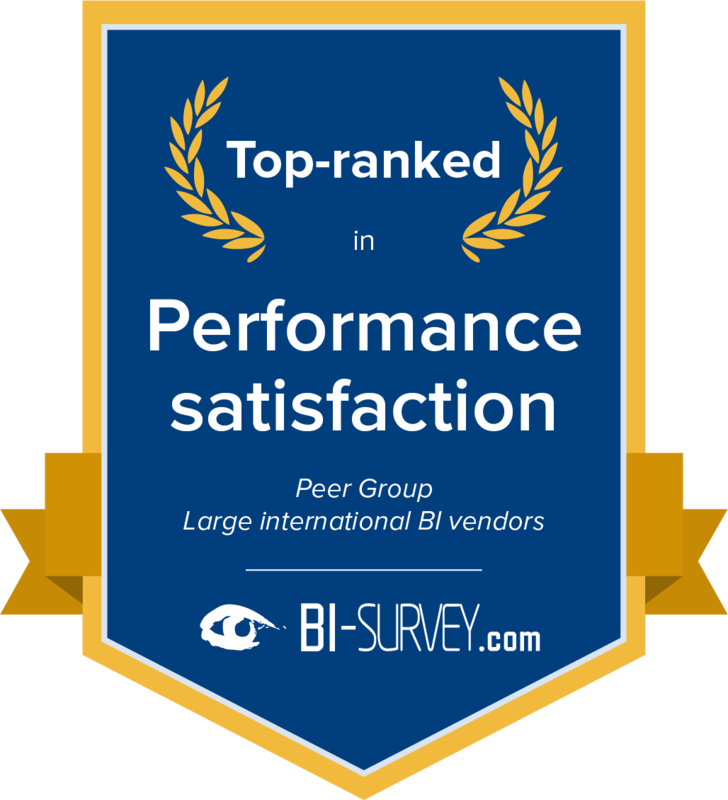 BARC’s Vendor Performance Summary contains an overview of The BI Survey results based on feedback from Qlik Sense users, accompanied by expert analyst commentary. Probably the best all-around BI solution; excellent performance, ease of use, and affordable. Qlik Sense is loved by everyone. Easy to use and extremely flexible for end users. Detailed and programmable by IT. We also love the capabilities that extensions bring to the product. Incredible interface for business users, easy to load data in multiple formats via diverse channels, and excellent online support and community! Modern, clean tool that is fast to set up and use both from a developer and user perspective. Helps us get BI content out to wider areas of our organisation and improve data literacy with all users. Is very extendable with extensions and extra content to cover a wide range of use cases including external publication to the web or external users.